…or anything you like really! This is honestly the easiest project I’ve done so far! Find a shirt (black gives the best effect) that you want to spice up a bit! Get some chlorine (the type you use for cleaning) and pour a little in a cup or on a plate (don’t use too much at a time or your brain cells will start committing suicide because of the fumes). Put a magazine or a piece of cardboard inside your shirt to prevent the chlorine to bleed through. 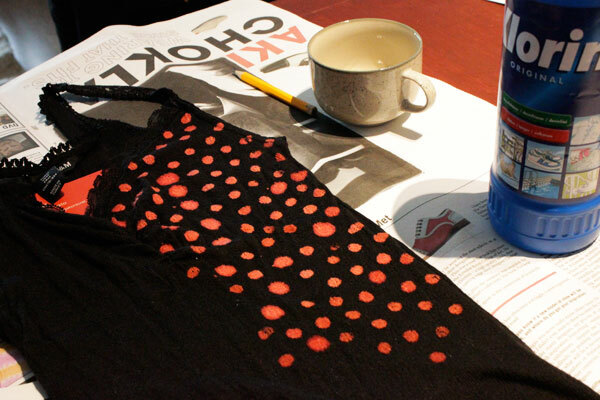 Dip the end of a pencil in the chlorine, start dripping dots on your shirt and watch things happen! Voilá, wonderful polka dot madness! You could also try to draw or write on your shirt with a thin paintbrush dipped in chlorine, the possibilities are endless!